spends time on the best bodies of water. used for walleye jigging come in a host of lengths, actions and price points. Not long ago I picked up a rod from a “designer rod brand” and almost fell over when I saw the $425.00 price tag. Yikes, I would be afraid to take a rod that cost that much out of the rod locker! Needless to say I put that one back on the rack very carefully. For as long as I can remember people have been talking about how this rod is more sensitive than that rod, how this modulus of graphite is better than that one and how if you want a “quality” rod you have to be willing to part with some serious cash. The one I love the best is watching someone at a sport show trying to pick out a rod while the salesman works his magic. Ever see someone holding a rod while the salesman is putting the rod tip on his throat and talking? The idea here is the rod is “so sensitive” that the guy holding the rod can feel the subtle vibrations from the salesman’s voice. Okay, time for a reality check. The sensitivity and or functionality of a jigging rod isn’t measured by holding the rod tip to your throat and humming. I haven’t actually tried it, but knowing what I know about science and how vibration passes readily through solid items, I’m pretty sure I could duplicate that “throat” trick with a piece of iron rod. The fibers used to manufacture graphite rods are typically graded using three different identifiers including IM6, IM7 and IM8. These symbols are the manufacturing marks of the Hexcel Corp., the company that produces Hercules Fibers widely used in manufacturing graphite fishing rods. Rod manufacturers use this information to classify their rods primarily for price point purposes. The symbols IM6, IM7 and IM8 were not intended to be used as justification for the sensitivity and/or quality of a fishing rod. Ironically, even companies that don’t use Hercules Fibers in their rods, but carbon fiber from a different source still use these symbols to grade their products. In other words, the symbols IM6, IM7 and IM8 these days can be misleading and are not particularly useful in terms of grading the quality of a fishing rod. Most anglers also don’t fully understand the term modulus as it pertains to fishing rods. Modulus refers to the stiffness of carbon rods. High modulus rods are stiffer and in turn less material is needed to achieve the same stiffness rating as low modulus rods. The important byproduct here is weight. High modulus rods are lighter in weight because they require less material than low modulus rods. Lighter rods are not only a dream to hold and fish with, they tend to be more responsive which means they can store and release more energy. From the practical perspective, high modulus rods have greater power for fighting fish, they tend to deliver more energy and distance to each cast and because they are lighter in weight they are less fatiguing to fish. but this was a pivotal point in his jig fishing skills. anglers begin enjoying more and more confidence. Ever wonder what sets the price structure on fishing rods? To a degree the materials used to make up the rod influence on the final cost. These materials include but are not limited to the modulus of the graphite fiber used in construction, line guides, reel seats, handles, painted or non-painted blanks, etc. Truth be told, the cost of a graphite fishing rod is also strongly influenced by the brand. In other words, fishing rod manufacturers are using similar raw materials and parts in the production of their rods, but the final costs on these fishing rods varies greatly brand to brand. This is particularly noticeable in the designer brands that specialize in premium quality and premium priced fishing rods. The question becomes, are these high priced rods more sensitive and better fishing tools? The answer is yes and no. High modulus rods are lighter and more responsive making them a superior product. Not surprisingly high modulus rods generally fetch a higher price on the market than lower modulus rods. That part makes sense, but in the real world it’s very, very difficult for the average angler to tell the difference on the water between the various high modulus fishing rods. The designer brands like G. Loomis, Lamiglas and St. Croix charge more for pretty much the same thing produced by Daiwa, Shimano, Berkley and Okuma. This business model isn’t limited to the fishing rod industry. The parts used to make the Cadillac Escalade are literally identical to those used to build the Chevy Suburban, but the cost on these two vehicles is vastly different. In short, fishermen buy what looks and feels good to them when picking out a fishing rod. Often these same people are influenced by the bias of sales people. In the end, folks who can afford more, tend to spend more and folks who can afford less, tend to be more conservative in their spending. As an avid fisherman I’ve always appreciated the “finer things in life” so to speak, but when it comes to fishing rods I simply can’t justify the high dollar some brands command from their rods. At some level the angler has to take responsibility and come to terms with their personal skill set. A skilled jig fisherman equipped with a modestly priced low or medium modulus rod is going to detect more bites and catch more fish than a novice equipped with the best gear on the planet. Obviously the place for novices to start is with less expensive gear and to gradually move up the scale as their skill sets improve. It’s important to note that lower modulus graphite rods are not clubs incapable of detecting subtle strikes. On the contrary, even modestly priced graphite rods are works of art compared to the rods produced just a few years ago. I tend to gravitate towards rods that represent a “good value”. There are literally hundreds of high modulus fishing rods out there that cost between $100.00 and $150.00 that rival anything manufacturers are trying to sell for $250.00 to $450.00. If you drive an Escalade this argument is probably falling on deaf ears, but if you’re like the majority of fishermen out there finding a “good value” is something special indeed. on the water targeting walleye with jigs. In the world of walleye jigging rods, the one size fits all model leads anglers down a slippery slope. 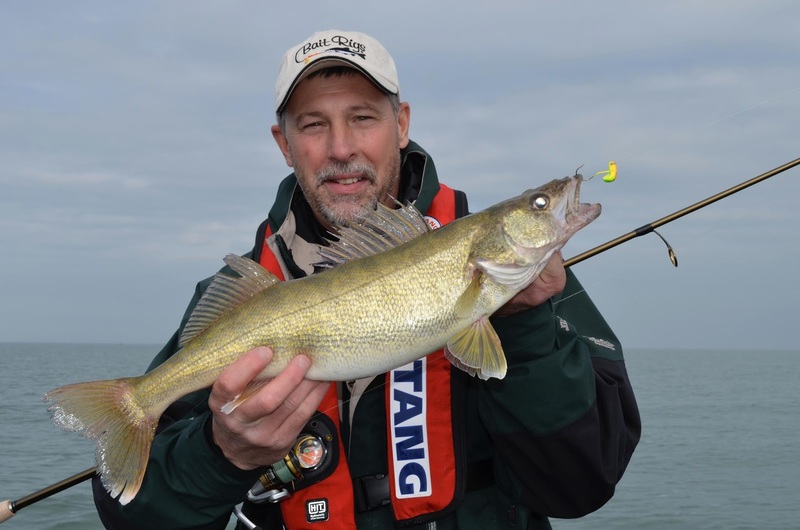 Jigging for walleye is a lot of different things to different anglers. A fisherman vertical jigging on the Detroit River with a 5/8 ounce jig is going to require a different action rod than another fisherman casting 1/8 ounce jigs to shoreline cover. To simplify things for fishermen I often recommend that walleye anglers purchase two different types of jigging rods. A shorter and stiffer rod is suitable for vertical jigging with jigs ranging in size from 1/4 to 3/4 ounce. A longer and more limber rod is recommended for casting lighter jigs from 1/16 to 1/4 ounce in size. The vertical jigging rod is generally going to be six to six feet - six inches in length and a medium or medium/light action. The casting or pitching rod is going to be seven feet to seven feet - six inches in length and a medium/light to light action. There are no “action standards” among fishing rod manufacturers. A medium/light action in one brand might be considered a light action with another brand. Because of this anglers in the market for a new fishing rod have to be somewhat open minded about “action ratings” on rods. When it comes to the art of jig fishing for walleye, the modulus of the rod, the brand or the action are not the most important elements. Spending time on the water and becoming skilled at jig fishing is vastly more important than getting caught up in the materialistic nature of fishing rods. 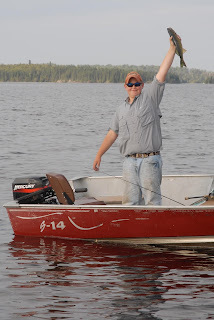 Learning to jig for walleye takes time and patience. The learning cure is also more swift when fishing bodies of water that provide anglers more opportunities to hook and land fish. The savvy here is to fish places where an angler is going to find and catch lots of fish. It also helps to fish as often as possible with an experienced jig fisherman who can help flatten out the learning curve. The price of a jigging rod is not necessarily the best way to judge the functionality of that rod. Just because a fishing rod costs more, doesn’t mean that rod is more sensitive or better able to help an angler detect and catch more fish. 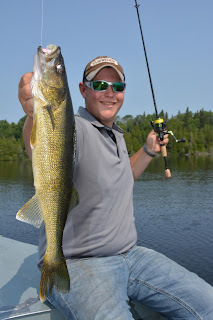 When jig fishing for walleye there is no substitute for “skill” and the only way to get skillful at jig fishing is to do it a lot. The moral of this story is gear up and get out there. Time spent on the water is far more important than time wasted listening to brand bias others feel impelled to share.